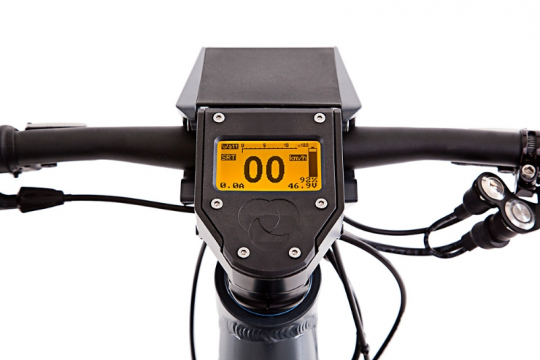 This is a guest post from Brett Thurber at The New Wheel electric bike shop in San Francisco. The first step in understanding something is to define and categorize it; this goes for product development as it does for science. A product without a fleshed out category or, worse still, a mundane or uninspired category is doomed to irrelevance. Electric bikes have had a problem with definition. For a long while the problem was technological: the utility and elegance against price equation of an ebike did not work. Marketing couldn’t change the technological weaknesses. But today things are different. I got into the electric bike business two years ago because I found product available that wasn’t being sold and marketed in a way that matched how good it was. I saw an opportunity to help define electric bikes as an elegant technology that meshed with a modern ethos of doing more with less, and living better for it. Early on I was fascinated by a small manufacturer of electric bikes named Grace from Berlin, Germany. 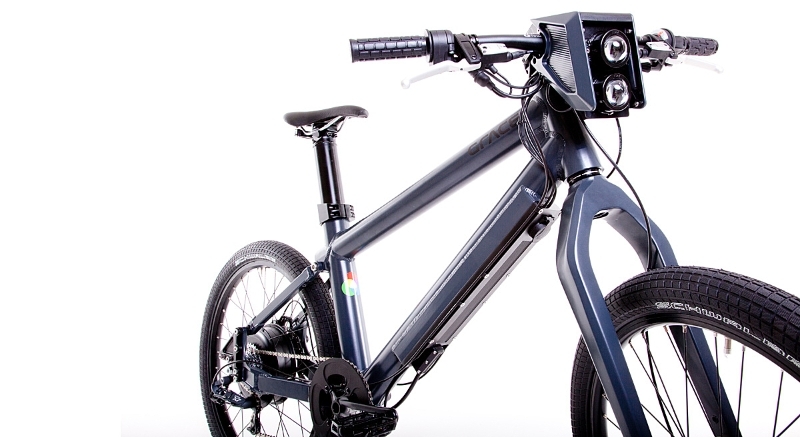 From what I could tell, they were doing on the product front what I was attempting to do in retail: they were building the quintessential electric bike in order to define the category. Actually, I later found, they were building three electric bikes: a city bike, an electric moped, and an electric mountain bike. Each of these three products is completely unlike the other, and each is unique among electric bikes on the market. I had the pleasure of trying all three of these bikes at the bicycle trade show Eurobike this summer, but recently I was lucky enough to have the opportunity to have an extended period with the Grace One stateside. 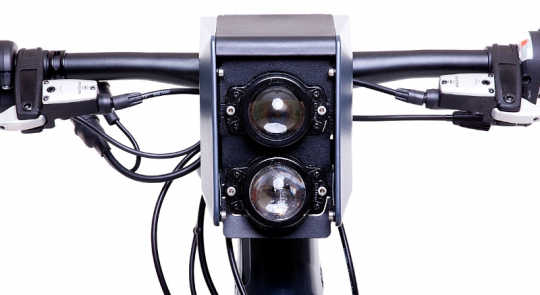 The Grace One is Grace’s flagship bike, their first product to market, and a bike that defines a category that is probably most easily comprehensible to Americans: it is a bicycle with a throttle. At our electric bike shop, we have shied away from stocking this category of bike, not because it doesn’t make sense but because it has always felt full of compromises: a bicycle with the ride quality of a washing machine but without the power of a moped. What you realize quickly on the Grace One is that it has been developed from the ground up as an electric moped through and through, with no compromises. It is sleek, sturdy, fast, exceedingly powerful, and has the battery capacity to get you to your destination, near or far. I rode from our shop in Bernal Heights on my typical bike commute back home across the Golden Gate to Sausalito, and the Grace One got me there in around 45 minutes. That’s about the same time it takes by car in traffic, and I had 30% battery charge to spare. 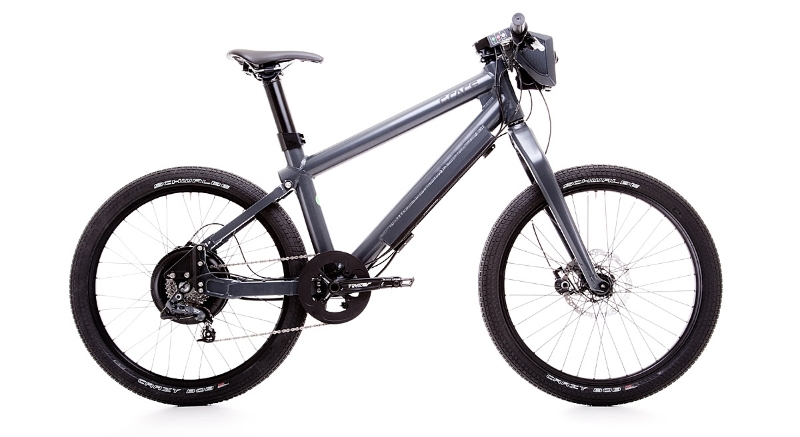 The fit and finish of the Grace One also suggests an ebike that is a category of its own. 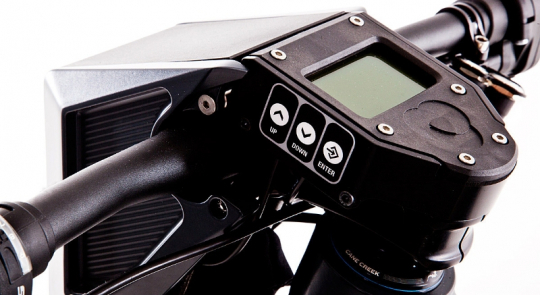 The bike turns on with the tap of an RFID key card you stow away in your wallet. The dashboard is comprised of a large orange display panel in the center that is controlled with four buttons on the right and left side of it. At your right hand is a quality Magura throttle, and below it two brushed metal buttons: one to fire the car horn hidden beneath the bike, and the other to enable the halogen high beam housed in the central console. A magnetically fastening charger fills up the large 576 watt hour battery hidden within the frame in a few hours. And then there is the way this bike rides. A twist of the throttle accelerates you quickly and silently up to a top speed of 45 km/h (around 30 mph). 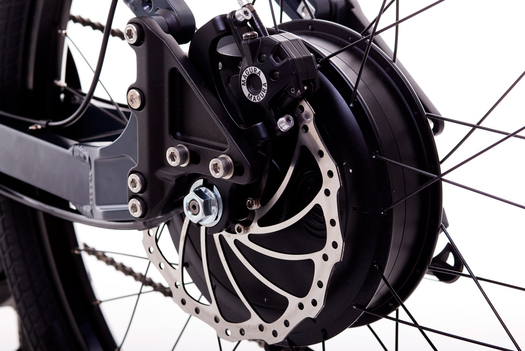 The extremely powerful Magura Julie high-pressure hydraulic disc brakes with 203mm rotors will ensure one finger all-weather braking. 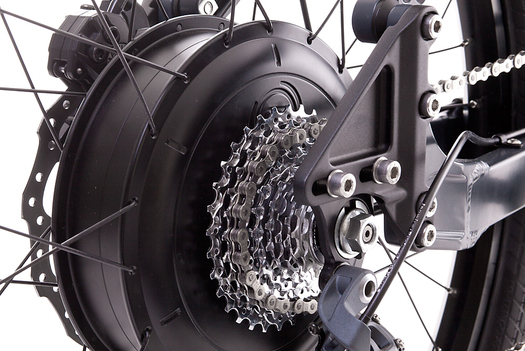 Due to the no maintenance 1300 Watt direct drive hub motor setup for higher speeds as opposed to torque, the Grace One benefits from pedaling input in much the same way as a traditional moped benefited: to get the bike started and to climb hills. You learn rather quickly that to climb San Francisco’s steep hills, you need to either be adding pedaling power or have started up the hill at a higher speed – not hard to do with such a speedy ebike. To zip across town on the Grace One is to be on a level playing field with other motor vehicles. I dashed down Guerrero Street in San Francisco, a car thoroughfare that runs from south to north up and down rolling SF hills, and easily kept pace with traffic. Being on an equal footing with cars is what makes the Grace One a category defining bike as opposed to other throttle operated ebikes with limited range and speed that feel more like “me too” products. It is also what makes this bike so different from a pedal assist bike. Comparing the two categories is like comparing apples and oranges. If you are like me and appreciate the elegance of pedal assist, then you will just have to wait for Grace’s other category defining bike, the Grace Easy. But if a bike that is not just fast and powerful but has the component quality and features that makes you feel safe and in control with that much speed and performance, the Grace One is the e-motorbike you’ve been waiting for. The question remains, however, if this bike will fit in your budget at over $5000. But that is not for this review to comment on, other than to say that the value of this bike is there. The first few moments of riding an electric bike should elicit an emotional response as you realize in sudden rushes of understanding how daily life will be changed in splendid ways by the bike between your legs. The Grace One does this. The way it will upend daily life will not be the same as a good pedal assist electric bike. It will be different; unique to the new e-moped category that it has defined. End of guest post from Brett Thurber at The New Wheel. Do you have any questions or comments for Brett on his review of the Grace One? Please leave them in the comment section below. you can get a real motorbike for that. But I wonder does anyone know how to remove the 45 kmh speed limit? What do you think how much sense does the electric bicycle which you are not allowed to ride on the bicycle lanes, have to have insurance and registration has? Wouldn’t it be better if they would make some sort pedelec type?